ATLANTA – Nov. 10, 2011 – The Georgia Tech College of Computing’s Robotics and Intelligent Machines (RIM) Center will use a gift of nearly $1 million of robotics equipment from Coca-Cola Bottling Co. Consolidated (CCBCC) to create a Manufacturing Robotics Logistics Laboratory on the Georgia Tech campus. The new laboratory will allow RIM faculty and students—who come from across Georgia Tech, including the Georgia Tech Research Institute—to study the use of robotics in supply chain and fleet management. The new 3,400-square-foot logistics lab initially will be outfitted with $944,000 in hardware from a CCBCC prototype bottling plant. Built by KUKA, a world leader in manufacturing robotics and system integration, the equipment includes robots, automated guided vehicles (AGVs), conveyor technology, safety components and other system technology. 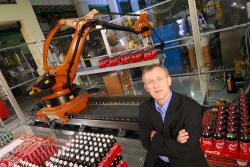 KUKA has provided the resources and manpower for delivery and set-up of the robots. Also providing resources to move the automation equipment to Georgia Tech and start-up the AGVs is Efacec USA, a leading supplier of Automated Material Handling and Storage Systems located in the greater Atlanta area. Specifically Christensen said Georgia Tech will use the laboratory for three purposes: creating optimization algorithms for logistics; testing sensing equipment such as automated cameras and laser sensors; and for supporting the annual Virtual Manufacturing and Automation Challenge, organized in conjunction with the National Institute for Standards and Technology. In addition to the specific uses Christensen envisions, he said the new lab will open up new possibilities for robotics students and faculty. Manufacturing—along with health care and service robotics—is one of the three main robotics areas to which the United States should devote the bulk of its research focus and support in the future, according to a 2009 report by the Computing Research Association.